"I have begun to despise politicians and their ways. At my age, I don’t want to photograph any of them unless Barack Obama visits India." 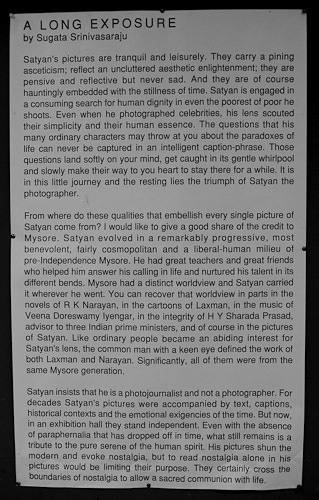 As India goes to the polls at the start of its rather overwhelming general election, the words of TS Satyan, a revered photojournalist who has spent his life chronicling India and Indians, offer a glimpse of how the modern world seems to those who have watched it age with them. I came across TS Satyan on a recent visit to Mumbai. India’s newspapers were filled with tittle-tattle in the build-up to its election – which begins today, 16 April. The leading paper, The Times of India, placed a modest banner headline at the top of each broadsheet page of coverage, branding the 2009 election a "Dance of Democracy". Amid low-level election scandal (centring on an anti-Muslim rant by Varun Gandhi, another member of the Nehru-Gandhi dynasty), there was a revealing interview with Satyan in the pages of Time Out Mumbai. Answering questions as an exhibition of his life’s work opened at the Institute of Contemporary Indian Art in Mumbai, Satyan – now 85 and a veteran of the Deccan Herald, Illustrated Weekly, Time and Life – described the pressures on photojournalists in India in depressingly familiar terms. Those wanting to take to this profession must consider it carefully. You have to know more and work harder to earn less than in many other professions. You need the strength of a packhorse to carry around all the equipment. You must develop resourcefulness, ingenuity and adaptability to solve assignment logistics. Most important, you must stay healthy, always. You have to be your best self. The expectations of editors and readers are high. News photography in modern times is not only fatiguing, but also dangerous and calls for alertness and dedication. In India there is not much money for those wanting to work for the print media. No wonder more and more young persons are branching out to other areas like advertising, industrial and fashion photography. Exhibited in the quiet confines of the ICIA, Satyan’s body of work was impressive. The common theme in the work hung in the gallery was of a quiet, knowing peek inside of India itself. He chronicled rituals, personalities and intimate moments often unseen by outsiders. His images were beautifully composed and lit with a delicate and natural touch. 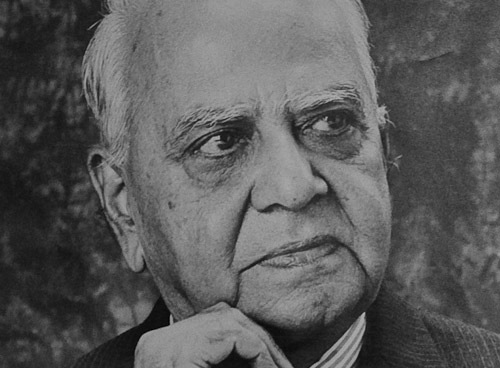 The literature at the ICIA included an introduction to Satyan, highlighting the influence on his work of his home, the educated, literate, princely state of Mysore – home, too, to one of India’s greatest writers, RK Narayan. And while Satyan in Time Out claimed he was most proud of those of his photographs with an artistic quality, the introduction stresses his roots in news photography. "Satyan insists that he is a photojournalist and not a photographer." But the photographer himself appears to lament the fast pace of modern journalism, telling Time Out he feels there is now a lack of interest in the work of what he terms "the concerned photographer". Indian editors are not bothered about him and his work. They are not visually thrilled. They don’t seem to realise that in its own way, a picture can activate the conscience of the reader. They don’t realise that without being preachy the photographer can sensitise, motivate and subtly show us the need to search our own hearts. It is unfortunate that rank commercialisation of the mass media has worsened the situation. 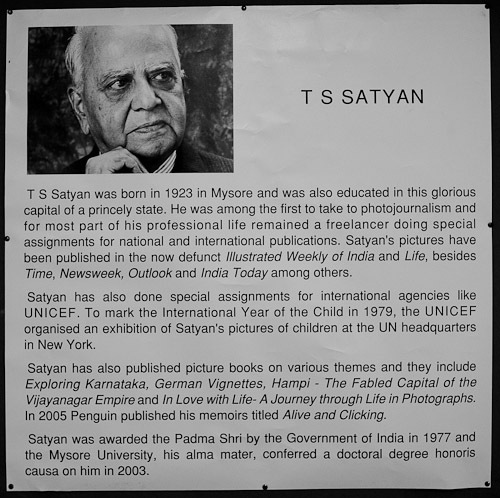 There appears to be no Wikipedia entry for TS Satyan (the best Wikipedia’s search engine can offer is "Satan"), so I have posted below my photographed copy of his biographical details, along with the introduction to the recent Mumbai retrospective.